On Thursday February 22, the Association Luisa Piccarreta joyfully joined the celebrations of the Saint Dominic church parishioners for the opening of the Parish Jubilee and of the Holy Door. It is a time of grace that has been offered to the entire city of Corato, to remember the five hundred years of the presence of the Dominican friars in the city. The Church of San Domenico is one of the oldest religious structures in Corato; It was born in the early 1200s as a Benedictine monastery, then it underwent a transformation in the sixteenth century when, thanks to the support of the Marquis Ladislao D'Aquino, in 1518, it passed to the Dominicans. Luisa Piccarreta is the link between the Dominicans and the Little Children of the Divine Will. We should remember that Luisa became a Dominican tertiary taking the name of Magdalene and embraced Saint Dominic’s ideal of life: love for the salvation of souls through the gift of Truth. The Jubilee Year was officially opened by His Excellency Monsignor Leonardo D'Ascenzo who presided over the Solemn Eucharistic Celebration . «This Jubilee year begins during the Lent - the Archbishop commented in his homily - and as Pope Francis said it is a period that gives us so many opportunities to start loving again, and reminds us that the heart of God is always open to us to give goodness, mercy and forgiveness ... This is my wish for this parish jubilee: to open our hearts to the love of God to receive it and then to give it to each other. 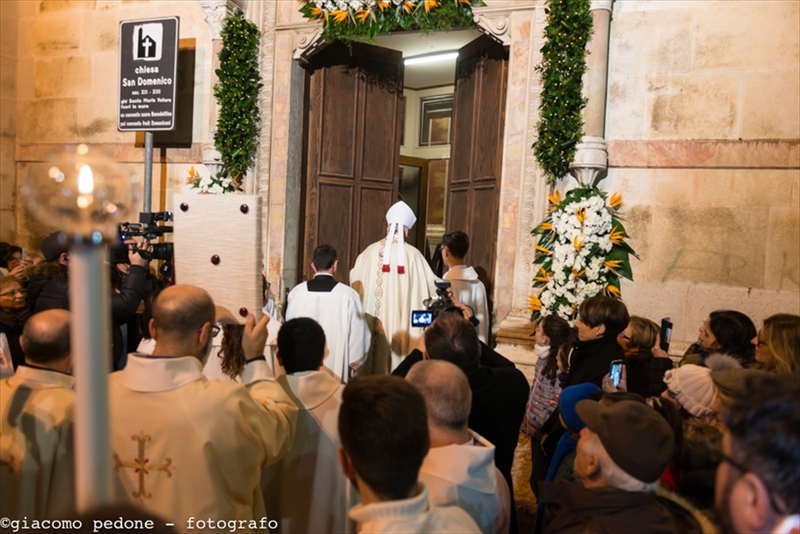 The Holy Door is Jesus - Monsignor D'Ascenzo highlighted - and all of us, when we…through the Holy Door, want to say that we want to go through Jesus, we want to follow Him. Jesus Himself, in the Gospel of John, identifies with the door (John 10: 9): "I am the door. If anyone enters by me, he will be saved. And it is Jesus Himself who in the writings of Luisa defines His Humanity and the knowledge on the Divine Will as the Door that opens the Kingdom of the Divine Will and allows us to live in it. • The next appointment with the community of San Domenico will be on March 3, in the context of the celebrations for the week of obedience (28 February - 4 March) when the Association Luisa Piccarreta attends the conference held by the Dominican father Francesco Giacomo Maria on importance of the Dominican laity.